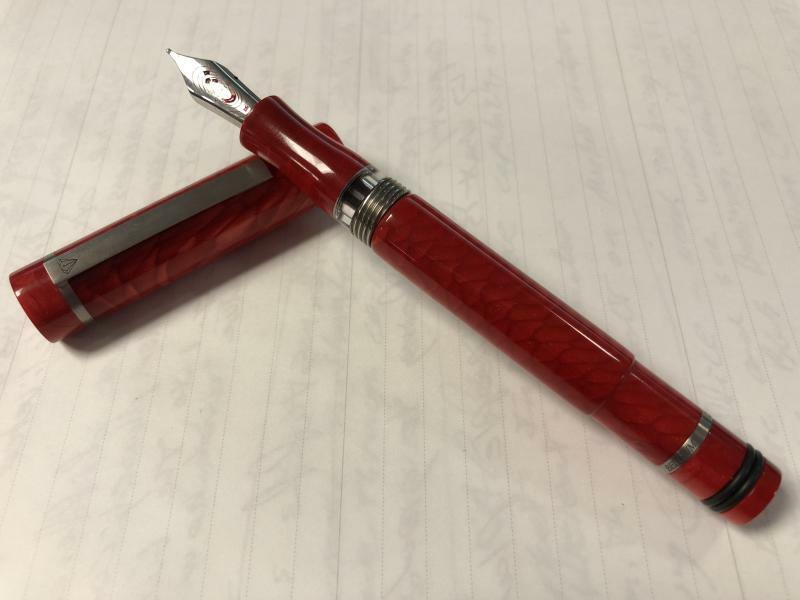 SO I received my latest Conid Regular, the Wonderful Red Antwerppen with a solid red Barrel. I ordered mine a couple of days after they were listed on the pen store sites. A day later I received a note that it would be a few days to ship and then shipping time, it was agonizing! It arrived in a wonderful red Conid box with the usual business cards and sample lines. The first thing I noticed was that the color around the pen is not uniform but various shading of reds mixed with the gold undertones. It makes a wonderful varied look, depending on where on the pen you look the color depth varies. I believe this is caused by the way the blanks were cut and I do like it! The thing that everyone seems to bring up is the Steel nib. 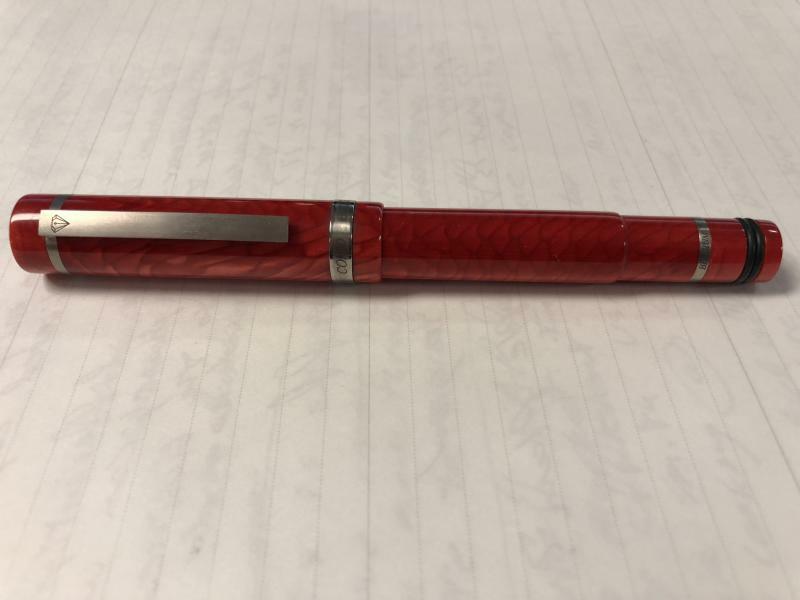 I have a Titanium one on order and it will ship next week, in the mean time I inked it up with the Akkermann Rembrandt Crimson to go with the red pen. The two go together so well. Back to the nib, it is fantastic! It is super smooth and flows just like I would want, yes I will try the Titanium nib in it, but I am really happy with the steel nib. This is my third Conid regular (still peeved that I missed the Cappuccino edition! )and they are all fantastic. Pretty pen. Haven't decided whether to order one yet or not. what's the price compared to the normal one? About an extra $150 US dollars (Price without VAT is about 505 Euros). Congratulation on the new Conid. Looks great and nice departure from the standard black and demo Conids. Been eyeing it since I saw it. Is the material a true red or a pinkish red as seen on the Conid website? It is a vibrant red with goldish scales that come through. The level gold undertones varies around the pen based on material variations. I liked this pen when I saw it at the London show, but it didn't have those black bands at the end of the barrel - what are they? I think they may decide me against this pen, which is a shame as I really liked it without them. So thank you for posting this review. Edited by bbs, 21 October 2017 - 17:38. Get a kingsize, they come without those black bands. Rubber O-Rings to hold the cap on posted. The king size is too long for my liking, and I never post my pens, wish those rings hadn't been added to the regular size. Never mind, I've spent more than I expected to on pens this month anyway. Kingsize isn't really that long. Sits perfectly in my hand. I don't have the AntwerpPen Kingsize though but dimensions are same. The cost is a lot higher though!! 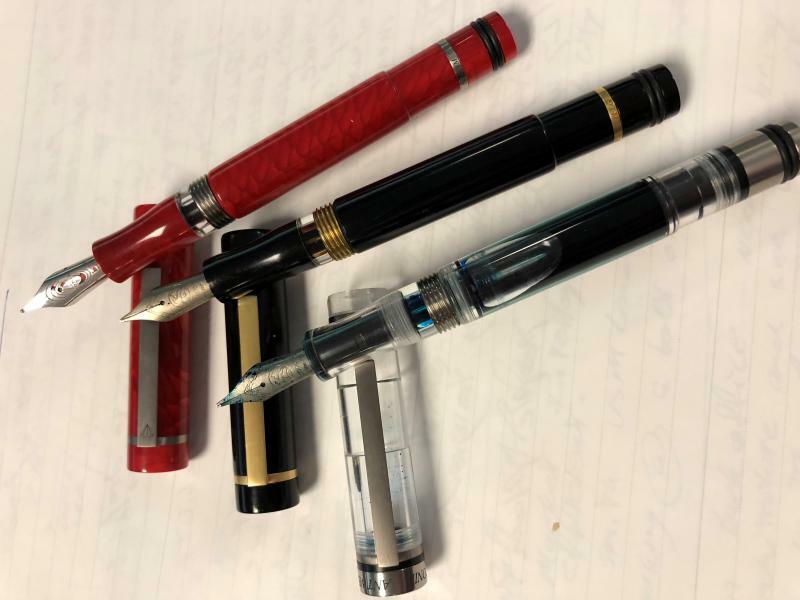 Until Conid, I didn't understand how people could want more than one of a certain pen....but now I understand and you have an enviable collection! Vivid, bright and intense, with pattern reminding of fish scales underneath. Photos from oldrifleman seem to be too dark, compared to my pen, but maybe there are differences between them. Anyway, this is something I was long time waiting for - Conid pen which is neither black-with-something nor transparent-with-something. Thanks for posting this review! I am really smitten by the material - now I'm on the fence again between getting the full red or the red demo modell ...Sigh, decisions, decision. Full red. No compromises. You won't regret. Yeah, sorry about the pictures, they seemed brighter when I posted them. The top picture is closer, but still a few shades too dark. These are Vibrant Red and so very nice! Thanks for the feedback - not really a Conid on my list (I own a regular and two minimalisticas), but I like the color. Good to read the nib is good!! Edited by darazs, 23 October 2017 - 18:24.